If something is easy to reach, we tend to use it frequently. That is true with information also. 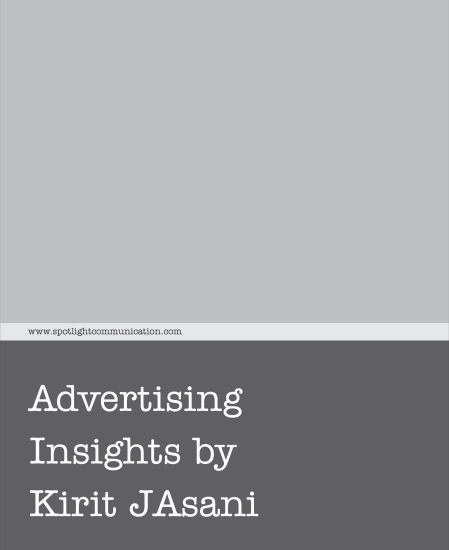 In past 7 months, I have shared information with you on branding and advertising by writing various topics on my blog. I hope; this information would have been of some help to you. However, it is quite possible, for some reasons you may not get connected to my blog precisely when you want to refer a particular post. So, I have prepared a PDF mini book of past 12 posts. Just download it and keep in your PC or iBooks and refer it as and when required. Following 12 points are covered in this PDF mini book. How to use customer testimonial in ad? What if your brand name is inspired by a product subcategory? How long you should continue with same visual? Is a good brief reason of good work? This entry was posted on Apr 11, 2016 at 1:29 am and is filed under advertising, Brand Identity, Brand Management, Brand Name, Branding, communication, differentiation, focus, Line extension, marketing, Positioning, Strategy, Uncategorized, visual. You can follow any responses to this entry through the RSS 2.0 feed. Both comments and pings are currently closed. is the little changes which will make the greatest changes.